The Snellen eye chart is the eye testing chart used by eye care professionals to measure visual acuity, or how well a patient can see without assistance. Dr. Hermann Snellen developed the eye chart in 1862. The Snellen eye chart is the familiar, classic chart of big and little letters. The chart consists of 11 lines of block letters, beginning with a large single letter on the top row. The number of letters on each row increases moving from top to bottom. The size of the letters progressively decreases, allowing for more letters on each subsequent line. The traditional Snellen eye chart only makes use of the following letters: C, D, E, F, L, O, P, T, and Z. 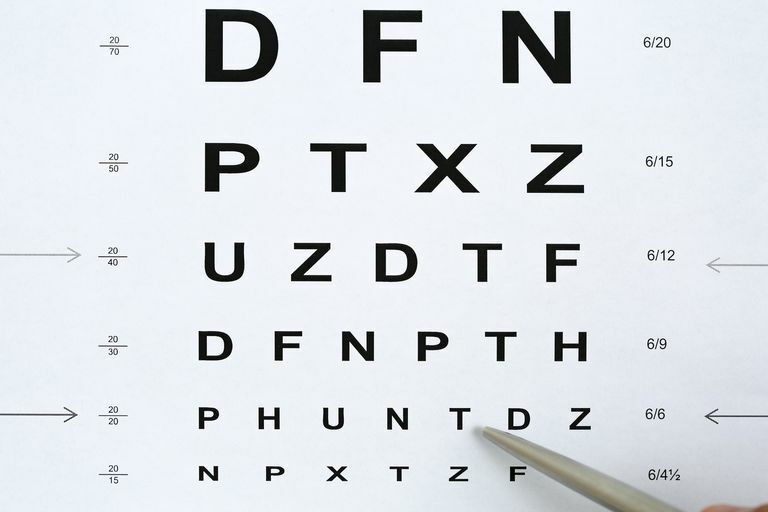 When testing for visual acuity, the patient covers one eye and reads aloud the letters on the chart, beginning at the top and moving toward the bottom. The smallest row of letters that the patient reads accurately determines visual acuity in the uncovered eye. The test is repeated with the other eye, and then with both eyes together. Visual acuity is sometimes expressed as 20/20, or a similar number, meaning the smallest letters accurately read on the chart. The results of your acuity exam (chart reading) will determine the quality of your eyesight. Your vision results (acuity) will be expressed as a fraction. Fractions are shown to the left of each row and identify how well you can see. If you could read clearly to the fifth line, for example, your vision will be expressed as have 20/40 vision; if you could read clearly to the seventh line, your vision will be expressed as 20/25. To interpret your reading, think of the numbers in feet. For instance, someone with 20/60 vision can read at 20 feet away what a person with normal vision could read at 60 feet away. Modern optometric exam rooms are equipped with electronic eye reading charts, making it easier to produce accurate readings. There are several versions of this chart for people, such as young children, who cannot read the letters of the alphabet. Some of these special charts have pictures to identify in lieu of alphabet letters or numbers. In the United States, a score of 20/40 or better is required to drive a car without the use of corrective lenses. A vision scare of 20/200 (or worse) determines that an individual is legally blind. The Snellen eye chart can be found and used online for determining your quality of vision. Use caution, however, because it can be challenging to receive accurate results with the many different sized monitors and screen resolutions available. The best way to determine your true visual acuity is to have an eye examination performed by a professional.